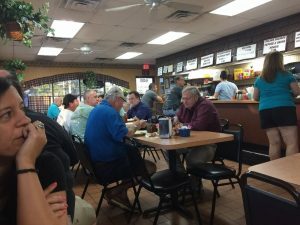 ***** DISH OF THE WEEK (Sunday-5/20/18-Orange Tree Breakfast & Lunch). 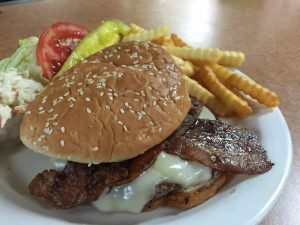 If you are a fan of “mom & pop” diners, you know exactly what this flat top grill- bacon cheeseburger and fries taste like! Well if you don’t know- Absolutely Delicious! ***** Orange Tree Breakfast & Lunch, 6400 North University Drive, Tamarac, Florida 33321, (954) 722-1144. Got a real good mom & pop breakfast/lunch diner for you guys, Orange Tree Breakfast & Lunch in Tamarac. Simple concept, counter/booth/table seating- open Monday-Saturday 6am-2:30pm, Sunday 7am-1pm. Long story short, the other day Jeff Eats and Mrs. Jeff Eats did breakfast at Orange Tree and I gotta tell you- delicious food, super pleasant service, reasonable “cash only” prices! If you’re into the mom & pop diner concept- I’m thinking that you’re really gonna like Orange Tree Breakfast & Lunch!